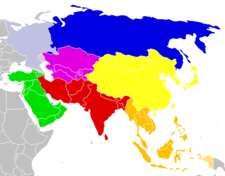 The continent of Asia is so large and diverse that it often is divided into sub-regions (see map below). Asia is rich in diverse races, cultures, and languages. Many of the world's major religions came out of Asia including Christianity, Judaism, Islam, Hinduism, and Buddhism. Asia has a major influence on world culture and the world's economy. Countries such as Russia, China, Japan and India produce products and services that are used by every nation in the world. Asia is also abundant in natural resources. Oil in the Middle East is a major supplier of much of the world's energy. Note: Go here for Southeast Asia and the Middle East. Both are part of the continent of Asia. Asia contains around 30% of the world's land area and 60% of the world's population. The highest point on earth, Mt. Everest, is in Asia. The lowest point on land, the Dead Sea, is also in Asia. 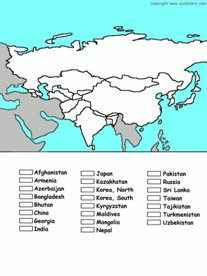 Asia is the only continent that shares borders with two other continents; Africa and Europe. It sometimes joins with a third continent, North America, in the winter by ice forming in the Bering Sea. Asia is home to two of the three largest economies in the world: China (2nd largest) and Japan (3rd largest). Russia and India are also top 10 world economies. Asia is home to many interesting animals including the giant panda, Asian elephant, tiger, Bactrian camel, komodo dragon, and the king cobra. China and India are the two largest countries in the world by population. China is number one with over 1.3 billion people. India is number two with over 1.2 billion. The third largest country in the world, the United States, only has just over 300 million people. Click picture to get a larger printable version of map.